Author Autumn Seigel, 21, resides in the small town of Wapakoneta, Ohio. Autumn loves to read, write, and draw. When she is not writing her original works, she is practicing her craft by writing fanfiction or drawing manga. Autumn writes in the genres of Science Fiction and Dystopian and all the way to the corners of Paranormal Romance. I discovered it in 2008 when I was in Washington DC for my 8th grade school trip. I was bored and wrote an anime fanfiction mashup for Shugo Chara and Kingdom Hearts. The library is where I have no distractions and can write easily. Nope, I just sit down and write when the need occurs. JK Rowling for a trad publisher. She was rejected a bunch of times before a publisher finally accepted her. For self-pub, I say Amanda Hocking because she started the same way I am now and became bestselling overtime. 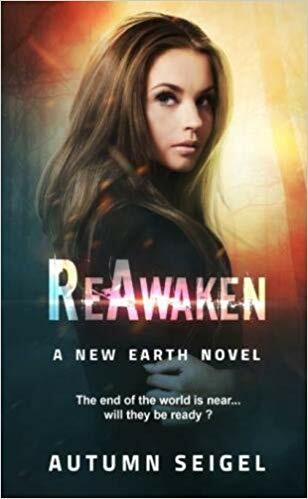 5) What inspired you to write ReAwaken? In 2012, the Mayan Calendar Apocalypse was the top of the news. I wrote the story with that theme in mind during the 2012 NaNoWriMo (National Novel Writing Month). Now that theme seemed dated so I decided to change it to something happening now…and that was Global Warming. ReAwaken is about a young girl who wakes up in a school with no recollection on how she got there. She must remember her past in order to save the world from a destruction she can cause. I love Trey Mason, the son of the antagonist and Arianna’s best friend. He can be funny in times that it’s not needed and can make someone smile. He’s kind of like me. Trust your friends is one but it also can give an awareness to Global Warming as well. 10) What would say has been your biggest challenge and achievement in writing ReAwaken? The biggest challenge was having characters with no emotions or memories. The achievement would be finally finishing the book after 4 years. 11) What have you learned about yourself as a writer through writing ReAwaken? That to never give up on learning something new. I have a learning disability so it’s hard to do some things. I actually have a hard time explaining things thoroughly and have learned so much hands-on with my editor. Never give up. No matter how many times you think you will fail, keep going. You may inspire someone else in your journey. You can do anything if you set your mind to it and push through those doubts and bad thoughts.